The Times table Rockstars have arrived at Riverside! 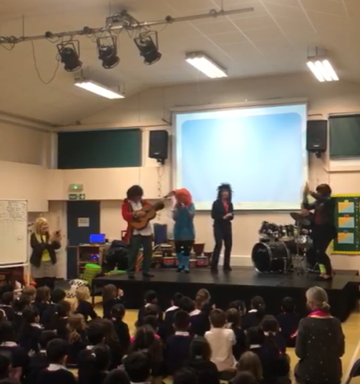 The children of Riverside were treated to a fabulous rock concert in assembly on Monday to launch our new timetable scheme! 2. A booklet in class in which they will be completing challenges in 3 times per week. All children are aiming to learn their timetable and to answer them within 3 second to become a timetable rockstar! 1. Downloading the app on your phone and tablet and logging in. 2. Helping them to log in at home on a computer. Regular practice of the timetable is they key to many other areas of maths such as fractions, decimals, percentages and solving multi step problems. To become fluent is the key to success. By encouraging your child to practice online via the app or website will allow them to become successful, confident and fabulous mathematicians for life! If you have any questions please don't hesitate to ask your class teacher to help get your child up and running online at home.